Hot tubs are a great way to relax and spend some family time together. They can be especially great during the winter months where it’s cold. So it’s natural that a hot tub is one purchase that you may want your entire family to be able to enjoy. However, depending on the ages and sizes of your children, you may have to consider taking some precautions before you let everyone in on the fun. Hot tubs are not necessarily bad for kids, but you should know a few things before you let your kids climb in. Kids’ skin is more sensitive than adults’ skin is, and hot temperatures can be damaging to them. There’s a reason why public pools put limits on how long kids should sit in their hot tubs, and you should do the same with yours. If your kids want to enjoy some time in the hot tub, you should not only limit their time but also lower the temperature. The Association of Pool and Spa Professionals recommends that to keep your kids safe during a 15 minute soak in the hot tub, the temperature of the water should be no higher than about 36 degrees celsius. This is a bit lower than the maximum temperature for hot tubs, which is 40 degrees celsius. A soak of no more than 5 minutes would be appropriate if you keep the water at this temperature. If your kid can’t comfortably sit in the hot tub with at least their head and neck above the water, the hot tub could be dangerous for them. Drowning is possible, especially if they are fooling around. You can use your best judgement, knowing how energetic your kid can be, but do supervise them closely. A hot tub can be a fun, relaxing way to spend time together as a family, and we hope this information will help you to keep it that way. Depending on the age of your children, you may no longer be required to watch their every move. 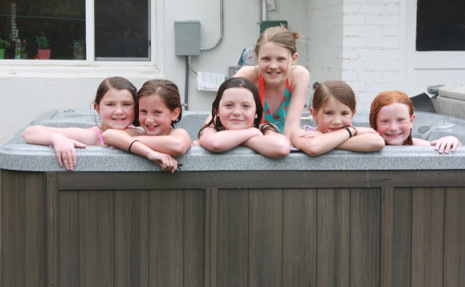 No matter what age they are, it’s best to get a really good hot tub cover to ensure they are always safe when you’re not around or watching their every move. These three things to watch for or only a handful of things you can do to make your Edmonton hot tub as safe as possible.